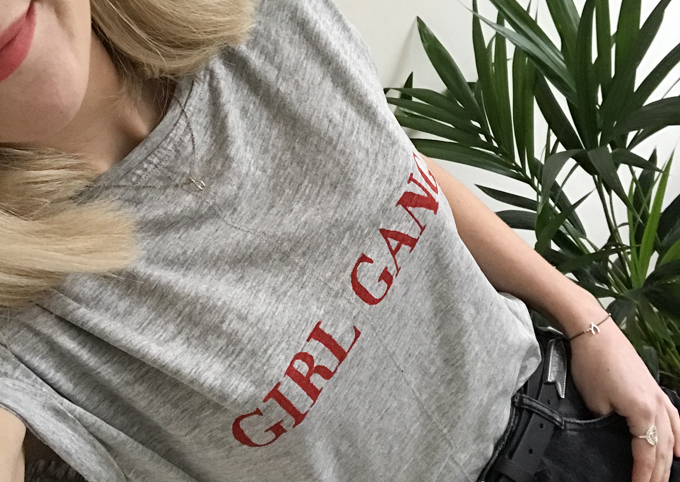 Without a doubt my favourite fashion trend this year has been the slogan t-shirt, and I am so glad it’s sticking around as we head into autumn/winter. 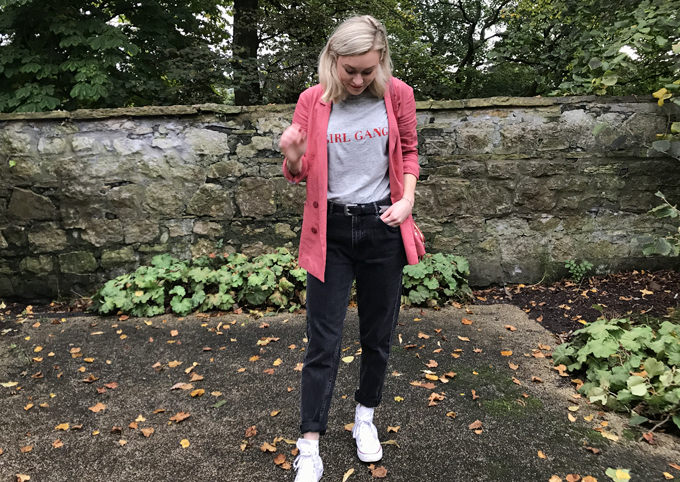 If like me, you love throwing on an quirky quote tee with some comfy jeans for an everyday, go-to look, why not give this quick and easy DIY a go?! It’s a great way to revamp a plain top into a statement, must-have piece this autumn. To start I printed off a quote I created in Photoshop and cut out the lettering using a scalpel knife and an old chopping block. I made the letters bold so it was easier to cut out and kept the little center bits from letters like ‘R’ and ‘A’ which fell out as I was cutting. 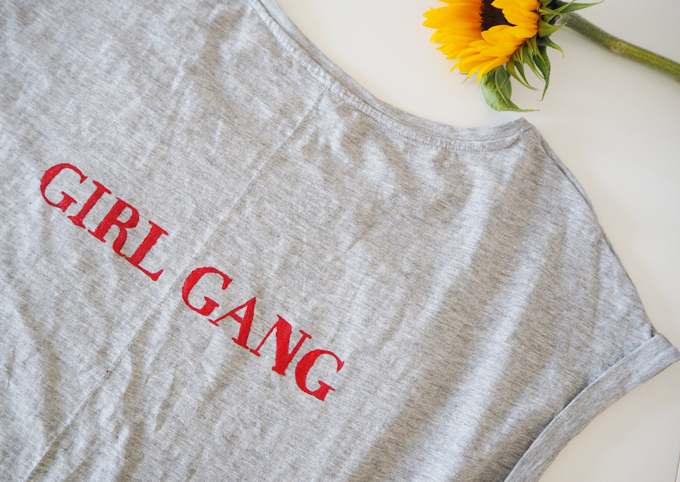 I have attached it here if you want to download this ‘Girl Gang’ template. Once the quote template was all cut out, I centered the paper in the middle of my tee so the slogan would sit across my chest. 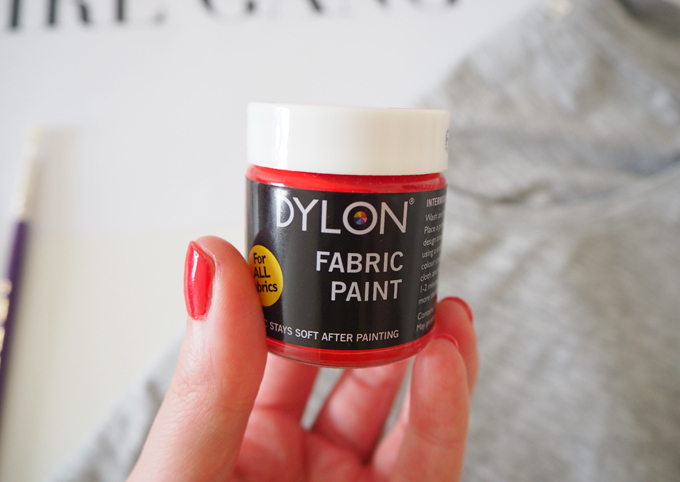 Using a paint brush I then dabbed this Dylon Fabric paint on to the stencil. Top tip: Secure the paper with pins to stop it slipping about as you paint. 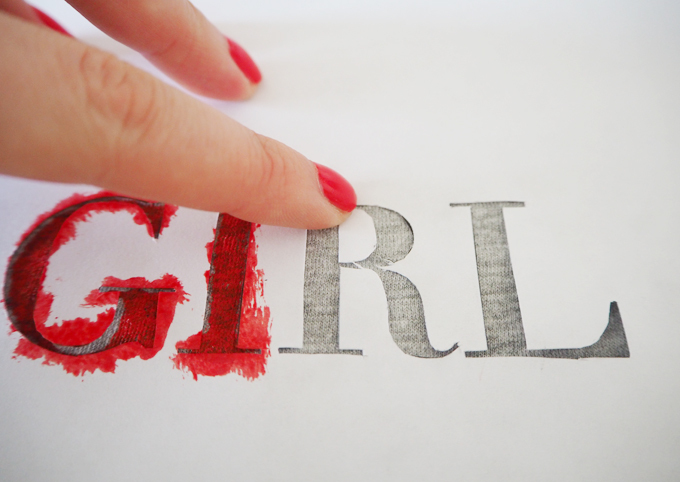 I placed the center bits of the letters that fell out in position as I dabbed the paint around. 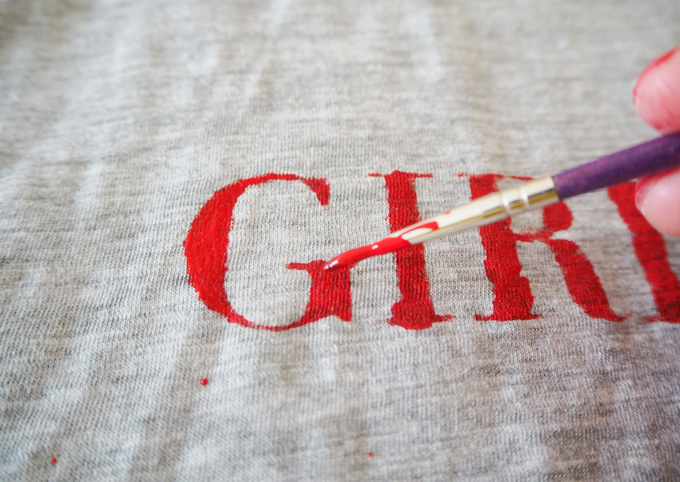 Once I had roughly filled in the logo, I lifted the paper off my t-shirt and went back over with a finer paint brush to smooth over the edges of each letter. 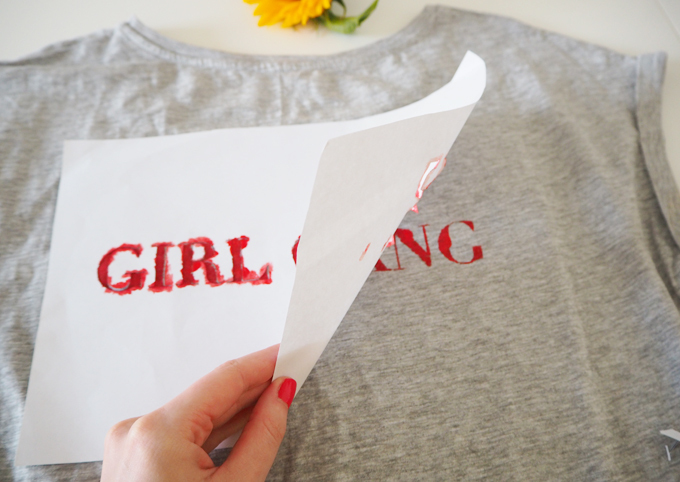 The fabric paint I used is fixed once you iron over it, so once the paint was dry I placed a scrap bit of fabric between the iron and my tee and applied a high heat over the logo. 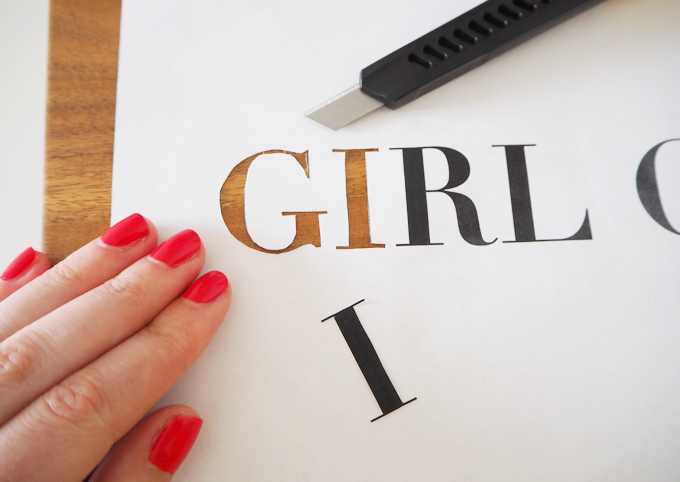 The best thing about this DIY is you can have any logo, colour or font you like, making it unique to you. 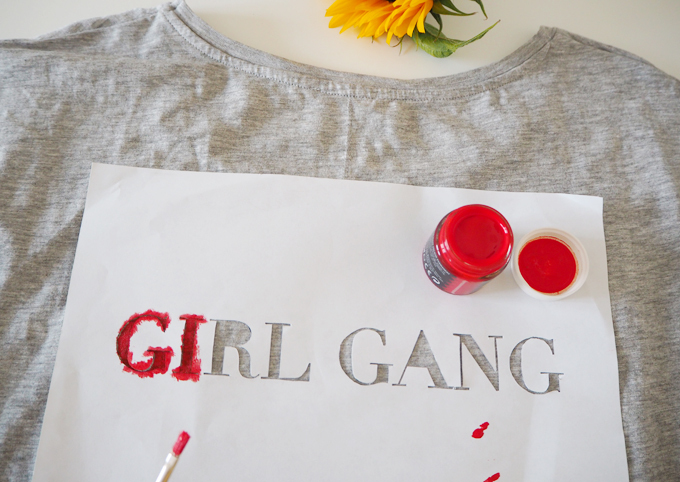 So why not revamp that old tee ready for the new season? I styled mine with an oversized blazer and some high-waisted mom jeans. 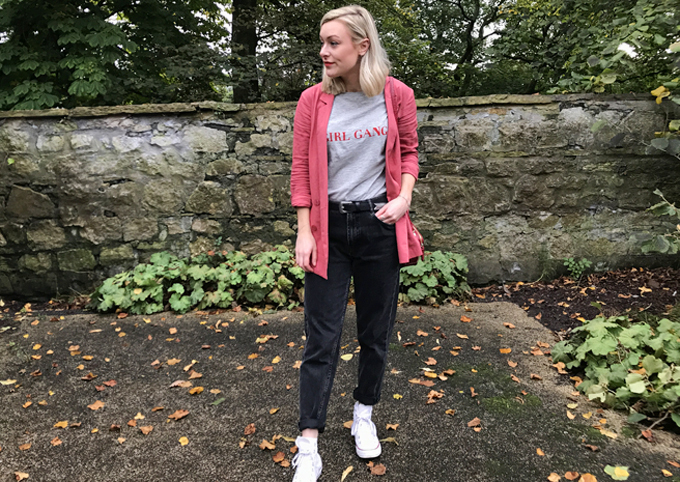 Although its breaking all the rules, I’m kinda loving wearing pink and red together at the moment, anyone else? Thanks for reading, I would love to hear what you are DIYing at the moment, or what you would like to see on Made Up Style in the future. What a cute shirt! I love having a chance to get creative, especially in my fashion choices, and so I love this idea! Thank you! 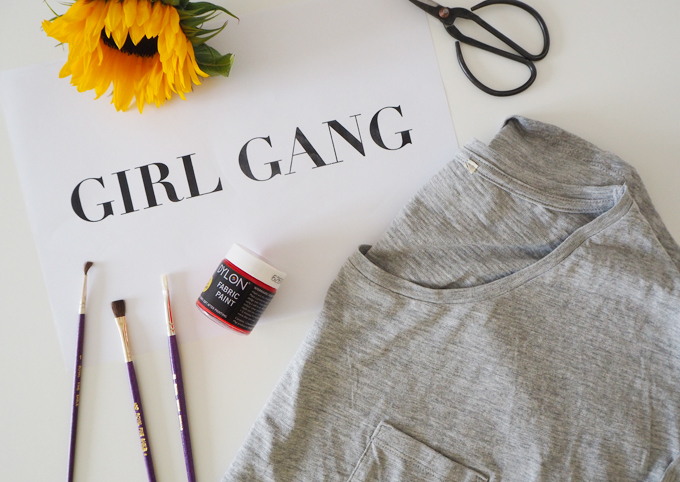 Yes I love a fashion DIY too!